If you have ever been a client, you know what great service and lousy service look and feel like. If you later made the switch to the other side of the table, to a public relations or other type of agency, you then had the opportunity to serve clients with the same level of service excellence you expected (and perhaps actually received) from your agency when you were the customer. Also, it pays to be familiar with the pressures and challenges of working on the inside, and you can get that only by working on the inside. Too many agency employees have an inaccurate picture of what their clients are up against because they have never walked in their shoes. Half of my experience has been as a client; during the other, more recent half I’ve served clients from big, medium, and small agencies. During the client years, I saw agency/client relationships disintegrate. Typically, it was death by a thousand cuts versus the result of a single infraction. Sad to say, I witnessed the same phenomenon while on the agency side. • Acknowledge receiving your client’s email or text with a simple “got it” or “will touch base with you on this” or anything that sends the message you are available. A client’s imagination can run wild when his or her attempts to communicate with you aren’t reciprocated in a timely manner. • On the other hand, don’t get upset if your client doesn’t respond to your emails or calls in a timely fashion. The agency/client relationship isn’t always a two-way street; that has to be OK with you, or you will make yourself crazy. Clients spend lots of time away from their desks, confined in conference rooms for meetings that go on and on and on. They also have their own internal clients to serve and politics to play. Cut them some slack. • Call your client. Email and team conference calls are great and have their purpose, but some of the best engagements and ideas come about when the account team lead and client chat live. Clients enjoy hearing from their agency, even if it’s just a call to check in. So pick up the phone. • Remember that the client hired the agency, not you. Show leadership by encouraging all members of your account team to be heard on the weekly group client call. Clients want to hear how every member of the team is contributing. For a client, there’s nothing more uplifting than when on one of these calls a junior person begins to “get it” and shares a brilliant idea. • Get the agency’s most experienced people involved with your client’s account. Invite them to an occasional brainstorm, especially around the bigger initiatives, and then tell your client about it. Most clients recognize that agency management isn’t involved with their account on a daily basis, but many have the fair expectation that senior agency leaders are making a contribution beyond invoicing. • Share bad news with your client sooner rather than later. Whether it’s a missed media opportunity, the resignation of a key team member, etc., clients have the right to hear about it as soon as possible because it affects their business. Too many agencies procrastinate in sharing negative developments with a client. Most clients, however, realize that despite best efforts, not everything is always going to go as planned. Work together on finding solutions. • Encourage your client to occasionally recognize the account team’s good work. They need and most often will appreciate the heads-up, and your team will do their best work for the clients who appreciate them. A version of this story first appeared on the author’s blog, What It Takes. How much do you need to talk about yourself? I read with interest two pieces of commentary over the weekend about friend, colleague, and friend of SHIFT Chris Brogan who wrote recently that a stunning number of people didn’t know what he did (he runs Owner Magazine). He asked quite vocally just how much he needs to talk about himself in order for people to even realize what he does. Friend, colleague, and friend of SHIFT Jason Falls said that talking too much about yourself also turns people off, so Chris is in a bit of a predicament: you can’t talk enough about yourself, but you can’t also talk too much about yourself. Small though this may seem, this is the exact predicament that many brands and companies find themselves in, from entrepreneurs to Fortune 50 companies. How do you ensure people know who you are (and why they should do business with you) without seeming like a raging narcissistic brand? Talking about yourself, particularly on your own channels, is owned media. It’s where you get to say how awesome you are, and it’s a fine thing to do in moderation. Talking about yourself is also something you can do on paid media, by taking out ads. While an ad that says, “I’m awesome” may not perform well, the concept does. You rent other peoples’ spaces to talk about yourself. The piece that’s critically missing from the above discussion is earned media – where other people talk about how awesome you are. 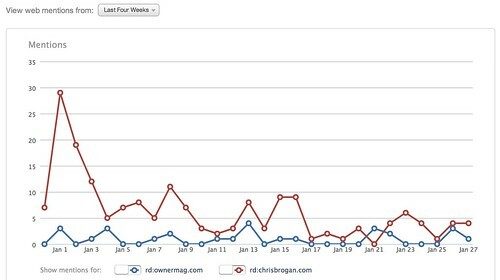 People are “talking” (linking) to his personal website 5.56 times more in the past four weeks than his enterprise. Owner Magazine’s problem isn’t that Chris isn’t talking about it enough, or that Chris is talking about it too much. It’s neither a frequency nor volume problem. The problem is that Owner Magazine only has an owned media strategy . There are no ads running for it right now. There aren’t enough other people (who aren’t Chris Brogan) talking about it (though certainly Jason’s post and this post are a good start) and generating earned media. Assuming that Chris didn’t want to hire a PR firm, his next strategy should be driving awareness about Owner Magazine through earned media channels. The quickest, easiest win that I can spot is to look at the authors contributing to Owner Magazine versus where Owner Magazine is getting its links from. Almost none of the authors are giving Owner any ink on their own web properties, so if I were Chris, I’d start there. How much do you need to talk about yourself? The answer is simple (but not easy): not as much as you need other people to talk about you. Resume Review: Hints, Don’ts and Advice For A Perfect Resume. The start of a new year is a great time to review your resume. Maybe you are ready for a move or just want to be ready. Has your job duties changed? Is it time to update your accomplishments? Is it time to cut some of the old and add new? Whatever is going on, start the year with an updated resume. In today’s job market, you must customize your resume for each job. Updating now, will make this easier for you. New Year, New You, New Job! It’s an advertisement for you, not your autobiography. Your resume is your chance to call attention to yourself for a particular job. Customize your resume for each opportunity. One-page resume or more? It’s your choice. Just be specific, concise and to the point. You want the reader to see that you have the background and to want to meet you. No gimmicks please. Gimmicks may get attention but they won’t make up for a sub-par resume. They do not transmit online well either. Formatting is important. It makes your resume easier to read/scan and it provides the reader with a roadmap to follow – all your titles, dates etc.will be in the same place. If you are submitting a resume online be careful of your margins. You don’t know how a computer scanner is set so leave at least a 1” margin all around. Since you don’t know the age or eyesight of the reader, use an easy to read typeface. Whitespace makes a resume easier to read and can highlight your keywords. Objectives are out, summaries are in. Unless you have specific objective and will only consider that type of job, use a career summary – a short concise pitch about you and what you have to offer. Update, Update, Update. Each job is a little different. Before you send out a resume update or tweak it for each job position. Resumes are written in past tense. You may opt to put your current job in present tense but the rest is in past tense. A resume is a marketing tool. Use it that way. It’s the paper that shows what you have achieved to take you to the next step in your career. It’s not a job description. Don’t lie. Titles, dates, compensation, education are all very east to check. Computers are often the first readers of resumes. They will scan for keywords. It is important that you use the keywords from an ad or job description in your resume. Otherwise, a human may never see your resume. References on request. This is a given. Don’t waste a line on your resume with it. Your resume is yours. It represents you and it is how you sell yourself. You can’t please all the people all the time. Listen to others and may changes if they work for you. Express intangible qualities that can’t come across on paper. Present a candidate’s social skills. Give the hiring manager an immediate and visual presentation of the candidate. Put too much emphasis on the visual appearance. Not be embraced by hiring managers and, therefore, be ignored. Your name, address, telephone numbers and email address. Identify your phone numbers if you are putting more than one (cell, business, home, message etc.) If you are looking for a job out of town and want to be relocated, put your full address on the top, as usual. If you are looking for a position where you have a residence or a place to stay lined up, use the local address. Also, remember to check the email box and voice mail you list regularly. In your description, put the company/agency name with a short explanation of the nature of the organization. Hiring managers might not be familiar with your employer or you may be working in a specific product unit of a large conglomerate. If you are working for an agency, list your clients or expertise within a specific industry. Under education, list the school, degree and dates. You might not want to put graduation dates fearing ageism will come into play. However, not having any dates makes your resume ‘suspicious’ and can make you look even older than you are. If you are fluent in language (s) or have knowledge of specific or technical computer programs, do list them. Current Board/Committee memberships can show interest in your field or in philanthropic areas. These should go on your resume. Don’t list any personal information such as birthdays, marital status etc. While this is common practice outside of the U.S., it is not done here. Keep the names of your references on a separate sheet and give them out when asked. First you don’t want to give out personal information or put it out online and secondly, remember that you always want to speak with your references to tell them who will be calling and the nature of the job before they get the call. Salary information does not belong on the resume. If a job is asking for salary history, it should go in your cover letter. Don’t include any activities that are not relevant. Long lists of past Boards/Committees or sports that do not pertain to your job search should not be included. Photographs should not be included on the resume. Again, while this is common outside the U.S., it is not done here. A senior-level communications position within a global consumer company. Social and digital media specialist position within a healthcare agency. Interested in furthering my career with an agency that focuses on international direct marketing. Extensive management experienced in integrated marketing, including work with global consumer products company and a major financial services company. Over 10 years of experience in public relations with a special emphasis directing media relations, social media, crises and issues, management and financial communications. Fifteen years experience in communications. Specialties include investor relations, public policy issues and crisis communications. It’s OK not to have one. If using an Objective, it should be as specific as possible. The objective of a resume is to find employment so don’t put this in your statement. Summary statements should be brief and to-the-point. Ideally 2 to 3 sentences. Statements should contain the information you want the reader to see and cover the disciplines you want to highlight. I am a confident, insightful and responsive professional. I am seeking employment with a well-established inter-national corporation. I want to play a leadership role in a marketing/communications capacity. Seeking a dynamic, versatile and challenging position utilizing strategic thinking. When emailing a resume, keep punctuation out of the subject line. Question marks and exclamation points can instantly send your resume to a spam box or make the reader feel that it’s junk mail. If you aren’t sure how to send your resume, cut and paste into the body of the email and also attach it. Some recruiters and hiring managers do not like to open documents. If you can reach someone on the hiring side, ask for their preferences. Don’t keep sending resumes every time you see an ad. If you update your resume, let the recipient know it’s an update and what you changed when re-sending. Referred by someone? Put it upfront of your email. Referrals usually get priority from a reader. Follow the directions on the site. Leaving unanswered questions will cause your application to be rejected. Do not use abbreviations (e.g., mgr. vs manager). Use standard capitalization and punctuation. Be aware that an overly formatted resume may not be accepted. Graphics and logos can garble. Provide keywords with context. Make sure your keywords are listed in the resume, but also frame them with descriptive material within the text. If your resume is not accepted, try calling HR. A sympathetic recruiter, coordinator or even IT person might be able to tell you why. Information that is too lengthy for your resume. Information that may be of interest to some, but not all,of your resume recipients. I’m often asked by junior colleagues or students for advice on how to be more effective in their careers. Though there are no magic bullets, I’ve found there is one surefire way to become a better all-around professional—perfecting the art of follow-through. Follow-through can make a big difference in every aspect of your professional and personal life. Though often overlooked by even the most seasoned professionals, closing the loop on an interaction, or following through, is the most crucial component in finding new opportunities, building relationships, and establishing your personal brand. Without follow-through, the most genuine and meaningful interactions result in missed opportunities. In business, the burden of following up falls on the person who establishes the need. For example, if you meet the CEO of a PR firm where you would like to work, it’s your responsibility to follow up after your initial meeting. On the other hand, if you meet a college student interested in career advice, she should take the initiative to follow up with you. After any interaction, follow up with the action items you agreed on within 48 hours. Make sure to include all the items you promised during your initial meeting, whether it’s your resume or an interesting article highlighting a trend you discussed. Social media networking should be treated the same as in-person networking. Engage new or important connections via social media by retweeting and responding to relevant posts. Be sure to acknowledge how the post added value for you (e.g., “Thanks, your information did this for me”). Context is crucial in any follow-up. Start your follow-up note with a reminder about how you met. Then mention something you have in common with the contact or something that stood out to you during your conversation to help jog your new acquaintance’s memory. I recently had the opportunity to speak to a group of students from the University of Florida. A student emailed me after the event and started his note with, “I met you when you spoke to the University of Florida’s PRSSA chapter, and you may remember me because we’re both from Coral Springs.” This is a great example of adding context, and it was helpful for me to have a point of reference, given that I met so many new faces at the event. This is also a great way to build rapport with clients. If your client contact mentioned they were going to Spain in your last meeting, don’t forget to ask how the trip went. Follow-through isn’t just about networking; it’s about creating opportunities to strengthen relationships. Chances are good that your new connection, client contact, boss or colleague is very busy, so be clear and concise in your follow-up communication. Keep it short, lay out your goals, and describe what you’d like your contact to do as a result of your note. He or she will appreciate your brevity and be more likely to give you what you need. If you don’t receive a response after your initial note, it’s perfectly fine to follow up again, as long as you provide context around why you are reaching out and why you need a response. Be pleasant, and reiterate your goals. In establishing new relationships, if someone doesn’t respond after two notes, it’s reasonable to assume they are not interested. Although your follow-up note should be professional, don’t be afraid to let your personality shine through. Be creative when infusing your personality without going overboard. A simple “Go, Gators!” or another personal anecdote can go a long way to strengthen professional relationships. Attending networking events, meeting new people, and having meaningful conversations is just the first step in building a strong professional network. Effective follow-through closes the loop in new interactions and leads to long-term relationships. By following the four C’s in all professional interactions, you can improve the quality and outcomes of your exchanges and, ultimately, build a larger network of valuable, career contacts that will serve you well as your career progresses. Smart PR practitioners know that it’s integral to strategic communications to have a client you can confidently and consistently put forward as a subject-matter expert. Whether you’re trying to pitch a fresh story, “news-jack,” or prep a conference speaker proposal, having a go-to expert with the right background is crucial to many a PR campaign’s success. Executives who can demonstrate superior understanding of issues and trends can earn the profile of a trusted industry insider, which only helps PR pros garner publicity on a client’s behalf. In short, if your client isn’t one already, it’s time to make him or her an expert. Home in on a topic and own it. Subject-matter experts are people who know a subject inside and out. Figure out precisely the topic on which your client can shine. Sometimes, the more arcane or obscure, the better. For example, there are a lot of retail marketing experts, but perhaps your client is an online retail marketing expert who specializes in imported footwear. Be as specific as possible. Encourage continuous learning. Truly great subject-matter experts are eager to amass even more expertise, and good PR pros can help. Set up relevant conversations with other industry folks for your client, share applicable videos to his/her industry, recommend networking events to attend, etc. Develop authentic, useful content. Subject-matter experts can create more of a name for themselves by publishing timely, useful, in-depth content. Whether this content is shared via a personal blog, the company website or through bylined articles in key outlets (ideally a combination of all), it’s important to get it out there. Don’t be selling. The expertise you’re sharing should be relevant to the brand, with credit to the client company, but it should never come across as a sales pitch. Content that’s overtly commercial will hurt your case rather than help it. Take advantage of speaking opportunities. Speaking opportunities on panels and seminars, particularly at major industry conferences, are a great way to get your expert out there and “strut their stuff.” Most conferences have reporters in attendance, which provides an excellent opportunity for the expert to get the recognition he or she deserves. Keep it social; keep it current. As a subject-matter expert, your client must be on company and other social media platforms putting his/her insights out there. Be mindful about keeping it fresh. Nothing says “no, thanks” quicker than a stale blog post from last spring. Although time-consuming, it will raise your client’s profile and keep him or her at the top of the must-have industry source list. Kaitlyn Kotlowski is an account supervisor at Crenshaw Communications. Follow her on Twitter@kaitanne. A version of this story first appeared on the agency’s blog, PR Fish Bowl. Is Cold Weather a Threat in the Sunshine State? Yes! During the harsh winter of 1989-1990, 26 Floridians died of hypothermia. Because of normally mild temperatures, Florida homes often lack adequate heating and insulation and the Florida outdoor lifestyle leads to danger for those not prepared. These severe cold outbreaks occur in Florida at least once a year. In addition to the actual low temperatures sometimes experienced across the Sunshine State, when strong winds combine with cold temperatures, the heat loss from a person’s skin can be accelerated. This is called the wind chill. The wind chill can make it feel like it is much colder outside than what the actual temperature is. The National Weather Service will issue Frost Advisories, Wind Chill Advisories, Watches or Warnings, along with Freeze and Hard Freeze Watches and Warnings when cold weather threatens an area. Do You know the 5 P’s Of Cold Weather Preparedness? Protect People: Remember to dress in layers and wear a hat and gloves. It is important to try to stay out of the wind and to stay dry. Also, remember to check on young children and the elderly who are the mostÂ sensitive to cold weather. Protect Pets: If cold weather is in the forecast, be sure to bring outdoor pets inside or give them a warm shelter to stay in. Practice Fire Safety: Use safe heating sources indoors. Do not use fuel-burning devices such as grills; they release carbon monoxide, which is a deadly gas. Also, make sure to use space heaters according to their instructions and be attentive to open flames. Current Wind Chill Map – Courtesy © Unisys Corp.
Current Temperature Map – Courtesy © Unisys Corp. Hazardous Weather Outlook – A statement produced by the local National Weather Service offices to provide information regarding the potential of significant weather expected during the next week. This is issued to advise storm spotters and emergency managers of potentially hazardous weather and other threatening conditions such as winter or cold weather outbreaks. Lessons To Be Learned From The Chris Christie Crisis: You Have Responded. Is Any CEO Totally In Control? Trust. Can We Depend On it?